the alexandria, louisiana city council's questionable ordinance was first reported from the blogosphere tuesday night from central la politics here and from wst... here. 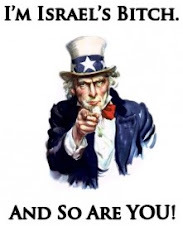 today, the town talk catches up with cenla's blogosphere (see link) and publishes a story: "legality of city council's bid to hire lawyers is questioned." 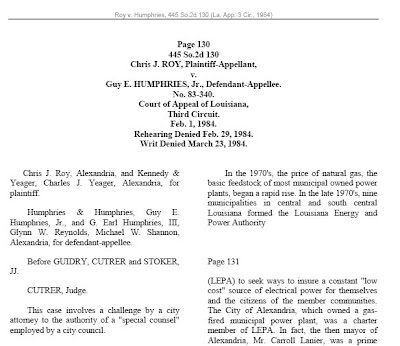 hiring the lawyers would be legal, citing Roy v. Humphries, a 1984 case in which the Louisiana 3rd Circuit Court of Appeal stated that the Alexandria City Council could have its own attorney in an "extreme public emergency." The public emergency in that case came at a time when Mayor Jacques Roy's father, Chris Roy Sr., was city attorney and then-Mayor John Snyder sued the City Council over a disagreement concerning a contract obligation to buy electricity from the Louisiana Energy and Power Authority. no such declaration of "extreme public emergency" exits in the city of alexandria today. unless, of course you're one of the bridgett brown 5 city councilmen, who are currently being being investigated by the louisiana attorney general -- then we guess being investigated would be an emergency - to you only. bottom line is that while roy v. humphries might have involved the alexandria, mayor and city council its not a case on point relative to the circumstances that are so evident in alexandria today. instead, the alexandria city council should look to the recent experience of rapides parish school board member herbert dixon who was charged with an ethical violation and had to go to court over it. mr. dixon was eventually exonorated of wrong doing -- but had to pay his own attorney fees. then upon court exoneration was allowed to recoup his legal fees from the rapides parish school board. 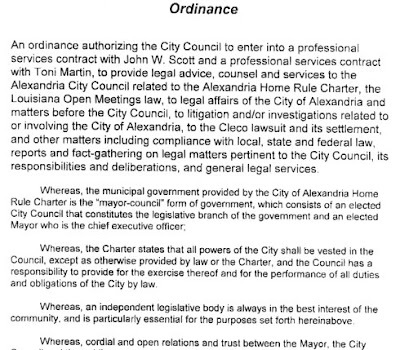 one would think that the city council would have already been advised of all this procedure because school board member herbert dixon's attorney was --- john w. "jock" scott one of the very attorney's that the city wants to appoint at taxpayer expense to represent them. the alexandria city council wants to have its cake and eat it too. they want to meet in secret - which they have already admitted to in letters and on video tape to deny citizens right to know -- and then when a citizen answers the mayoral call to action, have the taxpayers foot the bill in legal fees to defend them on it. only in louisiana. we certainly hope that the attorney general's office investigates this attempted ordinance; who drafted it, and when exactly the city council met to discuss offering it in the first place. unethical school board member seeks to become unethical state legislator?